Geoff Johns is writing Aquaman!!!!!! Could this become a reality? 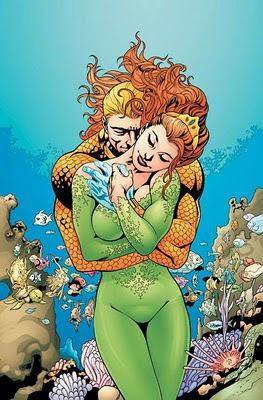 "Announced at Megacon: After BRIGHTEST DAY I'll be moving over to a new book - AQUAMAN #1 coming later this year!! :)"
Absolutely thrilling news! Not only is Johns a big enough name to attract loads and loads of new readers to the character, but he also happens to be one of the best writers of superhero comics in the business. At his best he has an uncanny ability to distil a character down to it's basic concept without jettisoning any of the character's back-story. He manages to remind us what's always been cool about a character while simultaneously giving us a fresh take. He's done this for the Justice Society, the Flash and his Rogues, the Legion of Super-Heroes, Booster Gold, Superman and most famously, and successfully, for Green Lantern. Now he's going to be doing it for the King of the Sea and I can't wait! I've got complete faith in Johns and I'm going to be on board with whatever he decides to do with the character, but I can't help but have a few hopes and wishes for the series. Like any good fanboy would do, I've listed them. Well obviously. Ivan Reis has drawn a fantastic Aquaman in the pages of Brightest Day and judging from his work on Flash I could imagine Francis Manapul drawing a beautiful underwater world. Patrick Gleason did a great job when he drew for the last Aquaman series and if his work on Green Lantern Corps and Batman and Robin is anything to go by then his style has developed and improved since then. 2) Please, please, please no delays! The worst thing that could happen to this book would be for it to get loads of hype surrounding the first issue and then lose that momentum because of a massive gap between issues. It wouldn't be the first time a great Geoff Johns story has been derailed by delays. Johns' latest Flash series has suffered this fate, as did the mini-series preceding it, Flash: Rebirth. A few years ago Johns co-wrote Superman: Last Son in the pages of Action Comics with Superman director Richard Donner. It's a fantastic story that's particularly notable for some great Lex Luthor moments, but at the time it had the wind completely taken out of it's sails by huge gaps between issues. 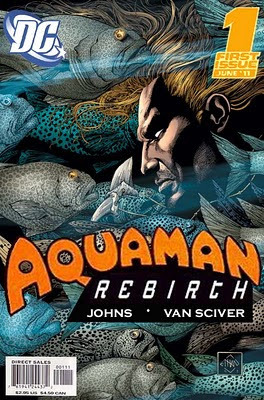 I've no idea what goes on behind the scenes, I don't know if it was the artists' fault or the editors' fault or even Johns himself, but I really hope it doesn't happen to Aquaman. 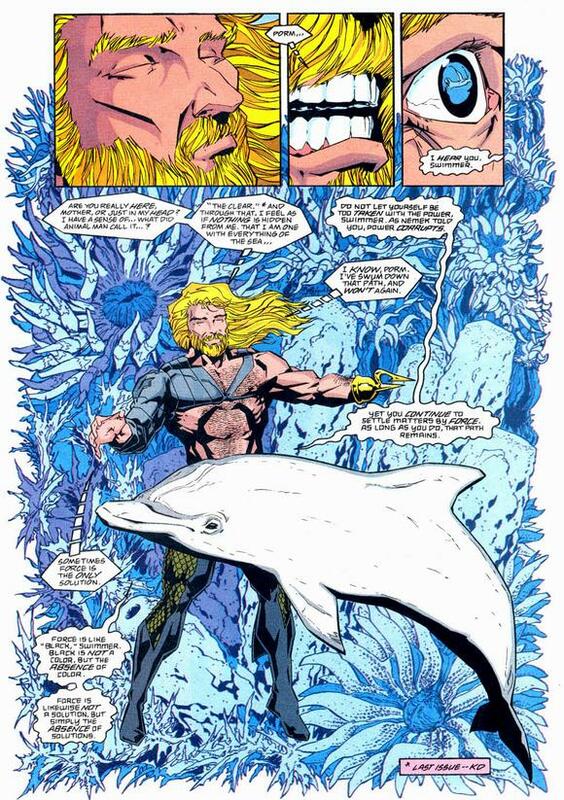 Peter David's work on Aquaman during the '90s really stands out for me as some of the best work that's ever been done on the character. It's a crime that his origin story, The Atlantis Chronicles has never been collected into one volume. I've previously listed all the reasons I love David's run here. If you follow the link you may notice that Peter David himself has commented on the blog post! That was definitely a thrill for me. Johns has indicated in the pages of Brightest Day that he's discarded the revised version of Aquaman's origin that David used during his run, in favour of the classic Silver Age origin in which Aquaman is the son of a human father rather than an Atlantean Wizard. That's fine by me. I have no problem with Johns presenting us with a version of the character with closer ties to the surface world. It makes perfect sense; why would he bother joining the Justice League if he didn't have a stake in what was occurring on land? But let's not completely discard all the important character development that occurred during David's run. David took the character on a journey from an angry, lost soul to a strong and decisive leader. I'm not saying Johns shouldn't bother with any character development but he should definitely bear in mind that the old 'superhero wracked with doubt to mighty King of Atlantis' transition has been done before, and been done very well too. Also, David developed Aquaman's powers in a really interesting direction. Just as Swamp Thing is connected to all of Earth's plant life and Animal Man to all of it's animals, Aquaman could connect to all of Earth's sea life regardless of where he was by reaching out with his mind through "the Clear". This idea was ignored by every single subsequent writer, so it would be great if Johns could acknowledge it in some way. 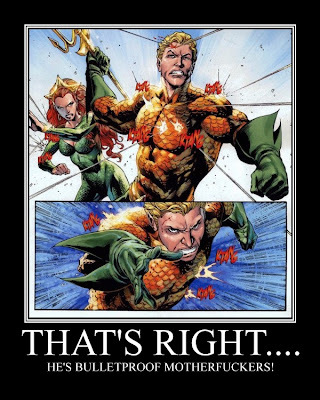 4) Aquaman should not be a miserable, preachy douche-bag! Aquaman sometimes gets written as a self-righteous, hot tempered git who'll declare war on the human race if he loses his keys. 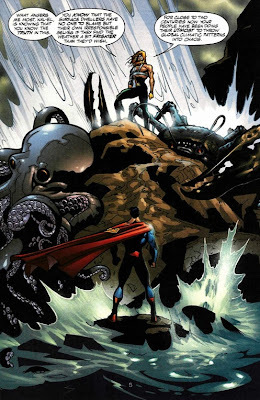 That's not Aquaman, that's Prince Namor, Marvel's Sub-Mariner. 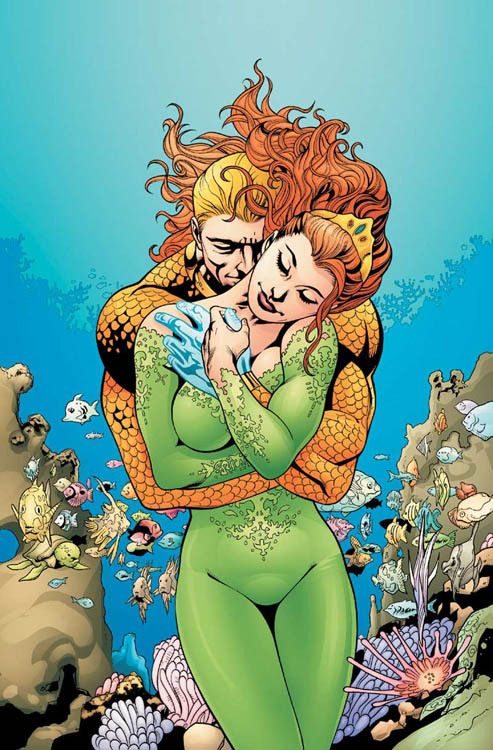 Sure, Aquaman can be grumpy and he'll invade your country if you really, really piss him off, but despite all the tragedy he's endured, at heart he's a compassionate family man with a sense of humour. Let's skip all the tedious, lazy depictions of Aquaman lecturing Superman about pollution. We've seen it a million times before and it was boring the first time. 5) Let's get a new take on an underwater world! Type "International Space Station" into YouTube and you'll find numerous clips of astronauts eating, sleeping and living their everyday lives in an environment where their feet never touch the ground and there's no such thing as up or down. The inhabitants of Aquaman's Atlantis have supposedly been living in such an environment for centuries and yet how many Aquaman comics have there been featuring such things as beds, tables, chairs and stairs? There have been many exceptionally talented artists drawing life in Atlantis over the years. Ramona Fradon, Jim Aparo, Steve Epting, Alex Ross and Jackson Guice are among my favourites. And yet not one of them (at least to my knowledge) has given us a genuinely original and imaginative view of life in an underwater city. Most of the times a few bubbles and passing fish are the only indication that we're not on dry land. There should be stuff on the ceiling! There should be doors and windows in random places. The beds shouldn't look like beds, they should look like weird cocoons that are attached to the walls. It should all look like nothing we've ever seen before. We certainly shouldn't be getting scenes like the one featured in Aquaman #63 (2000) where the otherwise brilliant Steve Epting draws a bizarre underwater birthing pool?!? !